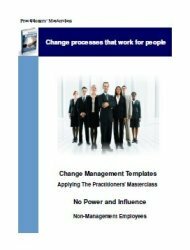 In this programme planning process there are no fixed parameters as to who should or shouldn't be included - it may be conducted with just a very small senior management team comprising 2 or 3 people - or extended to include a wider cross section of management and staff. 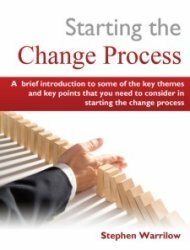 (3) in so doing, this can form an integral early stage of the change process. But whatever time is allocated, it is time very well spent as the process is designed to: (1) make you think deeply about your proposed change; (2) to understand as fully as possible the impact it is likely to have, and (3) to work out clearly exactly how you are going to reap the benefits from the change. If all this seems like a lot of work – yes it is! I won’t deny that this process can be time consuming – but it will ensure that you dramatically increase your chances of success. 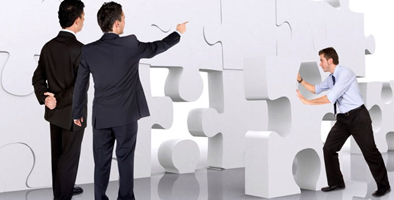 As a by product, you also save you an inestimable amount of time, hassle and money in the future. And considerably increase your chances of joining the 70% of failures. 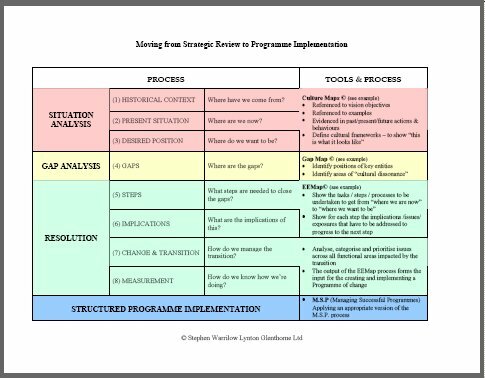 Here is the overview of Pre Programme Review and Planning using the EEMap process. Here is a brief document that introduces the key stages of the EEMap process that we will be using. I recommend that you find a spare room and cover 2 walls with flip chart paper. What we are going to do on the first wall is write up and draw schematically the fullest description of what your organisation looks like now, and on the second wall, what it will look like after the change. 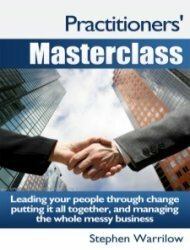 In addition to the obvious stuff such as organisation structure and core processes etc we are going to pay particular attention to the cultural aspects of your organisation. 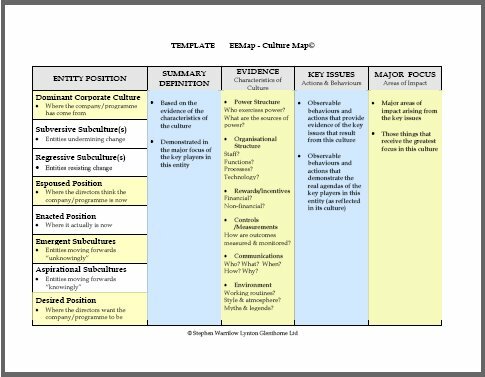 This is where the Culture Map Template is used as a prompt to identify and describe the different cultural entities within your organisation. 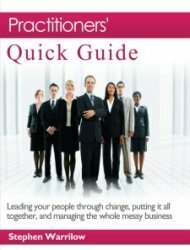 As an key part of your programme planning I recommend that you look carefully at all of the different culture and sub-culture types, and see how many of these you can identify in your organisation. I also recommend that you work through all of the questions shown, and apply them to each (sub) cultural group identified. 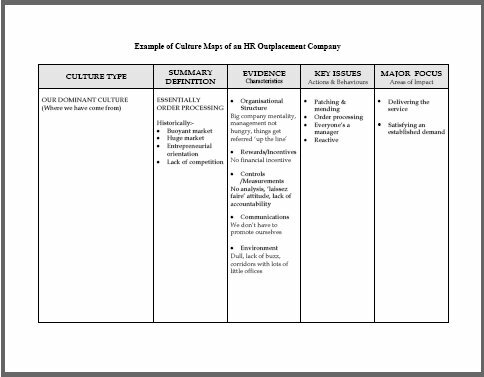 Example Culture Map and Gap Map that was created for a HR company. The Gap Map plots the positions of key entities within your organisation and highlights the gaps. As with the Culture Map there is no prescriptive way of representing this graphically - I use the style shown. It also helps to use the vertical axis as the line of cultural progression and the horizontal line as the time line. The whole purpose at this stage of programme planning is to create a simple pictorial representation of the different positions and the gaps between them. 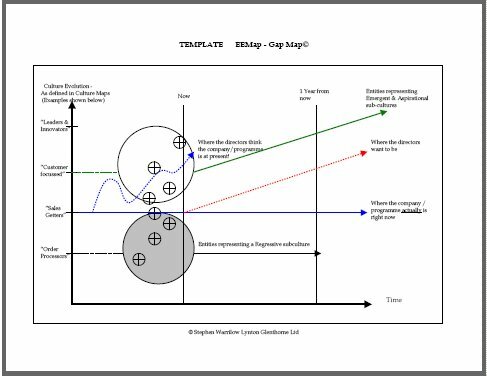 This is not a hard science but simply a vehicle by which directors and staff can articulate, visualise and discuss the reality of the gaps within their organisation and to do so in a unemotional and non-confrontational manner. The next stage of programme planning is to analyse carefully the gaps and differences between (1) the contents of what you have written on these 2 walls - i.e. the descriptions of how we look now and how we will look after the change, and (2) the different cultural entities that were identified. 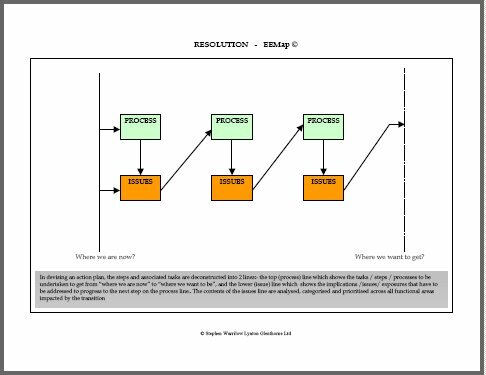 What we are looking at initially, is: (1) what these gaps and differences actually are, then (2) looking closely at and documenting the obvious steps - tasks - core processes that we are going to have to undertake to get from the present to the desired position. This is where the EEMap process is used to unpack the programme planning process. This is a diagrammatic representation of the thought processes and discussions needed to identify the issues, impacts and exposures that are going to emerge. The diagram shows the core process / task steps to be undertaken - and all of the implications, issues and impacts associated with each step. The underlying assumption here is that we cannot successfully progress from "Step A" to "Step B" without having identified and successfully dealt with the associated issues. All issues identified and associated with each programme planning step are now analysed, categorised and prioritised across all functional areas impacted by the transition. 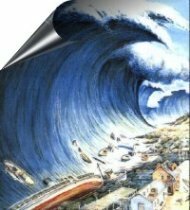 This EEMap analysis process will provide the input to the preparation and delivery of an executable programme plan and subsequently project plans. If at this point you are thinking to yourself that this all seems very simple and obvious - you are of course perfectly correct. But these steps are so simple and obvious that they are usually over looked - and the result is a 70% failure rate.